The following map gives a general idea of the area we cover but should be taken as a guide only. If in doubt give us a ring! We operate a fleet of 8 wheeled trucks capable to carry up to 10m³ per load. Please be warned that all our trucks are heavy and we will only access a site under the instruction of the customer. Our lorries are 10 metres long, 2.5 metres wide and 4 metres high. They need a reasonably smooth and firm surface to approach the drop point. As illustrated in the pictures our trucks all have excellent reach but not all jobs have easy access to allow a straight pour in the footing, slab etc. 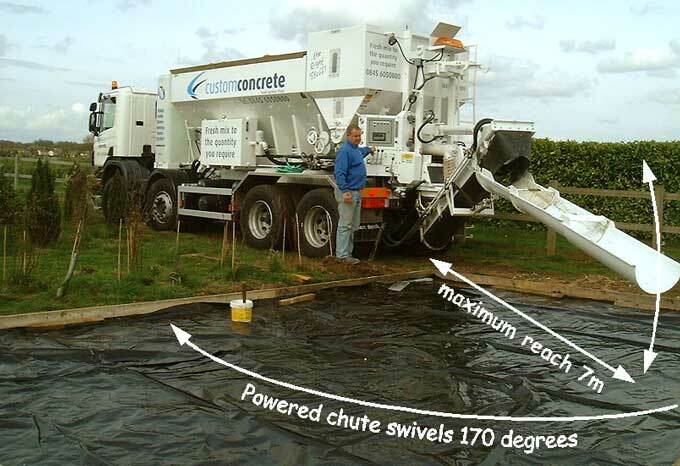 So when required we are happy to arrange concrete pumps, or pour direct into dumpers or wheel barrows. All our trucks are equipped with two wheel barrows that customers are able to use free of charge.